South Korean artist Jae Yong Kim’s installation Donut Ever Forget Me is made up of hundreds of hand-sculpted and intricately painted donuts. Each one is unique, and is topped with a high-gloss glaze. Kim views each of the donuts as a diminutive painting, with their decorated surfaces invoking the paint splatters of Jackson Pollock or the mesmerizing dot patterns of Yayoi Kusama. These labor-intensive pieces, each of which requires multiple firings in the kiln, can take several days to complete. Kim’s use of the ceramic medium and his appropriation of imagery by famous painters is a clever critique of the perceived divide between fine art and craft. By depicting row-after-row of sweet treats, rendered in a brilliant Pop-Art palette, he also explores the global culture of consumerism and invites viewers to consider their own consumption. Jae Yong Kim was born in Seoul, South Korea, in 1973. He received a BFA in Ceramics and Sculpture from the University of Hartford in Connecticut in 1998, and an MFA in Ceramics from the Cranbrook Academy of Art in Bloomfield Hills, Michigan, in 2001. 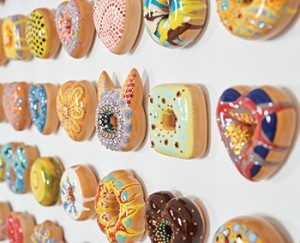 IMAGE: Jae Yong Kim, Donut Ever Forget Me (installation detail), 2018, ceramic, luster glaze, glaze, and Swarovski crystals, Courtesy of the artist and Lyons Wier Gallery, New York. This exhibition presents a rare opportunity for the Boise Art Museum, and for you! Jae Yong Kim has agreed to allow the Museum to sell the 483 original ceramic donuts on display in Donut Ever Forget Me over the course of the exhibition and is donating a portion of the proceeds to BAM. Purchase one or many! Please visit the exhibition and see the BAM Store to make your donut selection and purchase. The 483 donuts are available on a first-come first-served basis. Your artwork(s) will be available for pickup after the close of the exhibition on July 7, 2019.